Beautiful card case made from cork, features unique angle cut design. Holds about 15-20 standard business cards, or about 10 credit cards. Measures 4" x 2 1/2" when closed, and 4" x 5" when open. Some call cork fabric "vegan leather." It is incredibly smooth to the touch and surprisingly durable. A thin layer of cork has been affixed onto a cotton/poly textile backing. Wipes off easily with water. Cork is a great, eco-friendly option for your next handmade item. Choose the exterior color you want, as well as the color of the two pockets inside. Some keep it simple and select the same color for the outside and inside, while others like pops of different color for the inside pockets. 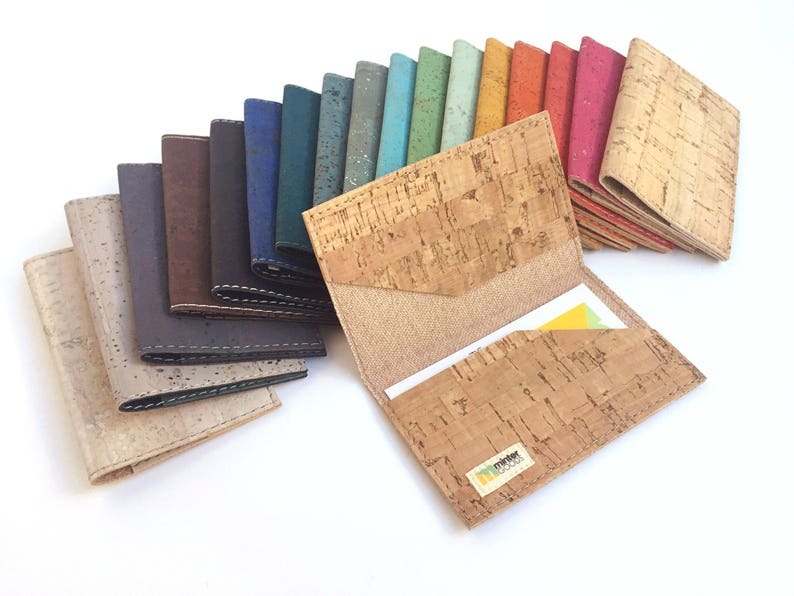 Your cork card case will be sewn with a neutral/coordinating thread -- usually tan which is similar to the natural cork color, or black or grey -- whatever looks best and blends in nicely with the cork colors you've chosen. Because cork is a natural material, there is some beautiful variation within the coloring and surface markings. This makes it a unique and well-loved material. All Minter Goods have been created in my smoke-free, pet-free home studio in Seattle, WA. Cork business card case, chocolate cork fabric. Card case. Card holder. Stocking stuffer. Cork slim wallet, beautiful texture. Card wallet, card case, card holder, small wallet. Cork card case, green cork fabric. Business card case. Card holder. Stocking stuffer. Cork business card case, orange cork fabric. Card case. Card holder. Stocking stuffer. Black baby booties with white spots. Gender neutral, perfect for a boy or girl. Cotton moccasins. Red + blue baby booties with triangle designs. Made with premium wool. Gender neutral mocassins. Patchwork baby quilt with teal, orange, gold, grey, white and minty green. Gender neutral, perfect for a boy or girl. Patchwork baby quilt with gold, grey and orange overtones. Gender neutral, perfect for a boy or girl. I love this holder so much. The colors are gorgeous, it is light weight and holds plenty of cards. It shipped pretty quickly and arrived just as fast. I'm so glad I made this purchase and it is perfect that it arrived on Earth Day, as it's important to me to use sustainable products as often as I can. Highly Recommend. The hand written note on my packing slip was a nice personal touch. Thank you! Love this product! This is a super cute way for me to present my business cards when handing them out to clients. And the cork is super soft! I just got my card holder - love the rich red color! Lots of color choices. It was surprisingly very lightweight, which I wasn't expecting but I think it is better because otherwise you probably wouldn't be able to fit many cards in there (vs. a tougher, less flexible material). Thinking about buying another for a gift! Baby booties, green + grey. Made with premium wool. Gender neutral mocassins. Classic denim baby booties. Gender neutral, perfect for a boy or girl. Cotton denim moccasins.